Data transfers between the United States and the European Union have grown increasingly complex. Multinational companies require certain levels of information sharing among locations in different locations as part of their day-to-day operations. In addition, data created on one side of the Atlantic may be relevant to a lawsuit or investigation on the other side. A question that we often hear is, “What should the retention policy be for my email?” Our response is always the same: “It depends.” There is no one-size-fits-all solution for how long an organization should retain its email because every organization is different, even though email is structurally the same. The nature of a lawyer’s duty of competence has been the subject of debate ever since the ABA revised its definition of competence almost four years ago to require lawyers to understand “the benefits and risks associated with relevant technology.” Since that time, much ink has been spilled advocating the importance of technological competence for lawyers, particularly in the area of eDiscovery. A high-profile trial involving technology titans Oracle and Google taking place in San Francisco this month spotlights the strategic importance of privilege reviews for litigation attorneys. As detailed in a recent article published by Big Law Business, arguably the most important piece of evidence in Oracle America v. Google is an internal company email that Google originally claimed as privileged. 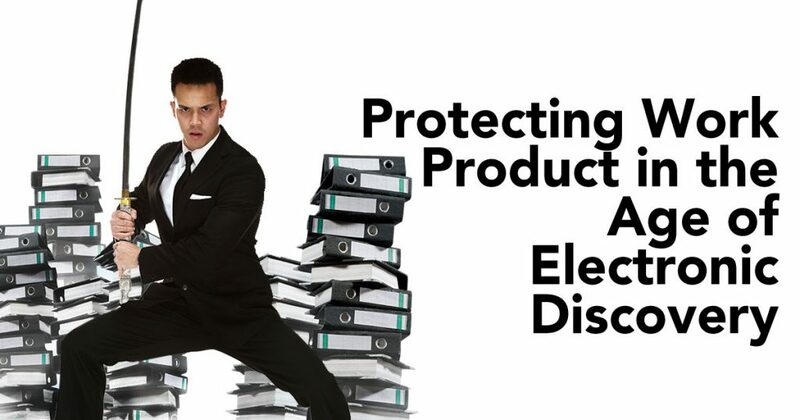 One of the most critical issues that attorneys must address in litigation is the need to protect their work product. Despite the importance of this issue, some lawyers have forgotten the basic elements of the work product doctrine. They might remember Hickman v. Taylor from law school, together with Justice Jackson’s famous injunction against preparing a case “on wits borrowed from the adversary.” Probe more deeply into nuanced issues such as the discovery of fact or opinion work product, however, and the answers may not come so readily.